I say there are 101 Biggles books and you can click here to see why. If there are 101 Biggles books, why is it that the numbering on the spines only goes up to 84? – This being the number on the spine of ‘Biggles Sees Too Much’? The first thing you need to know is that there were nine different original publishers of the Biggles books. 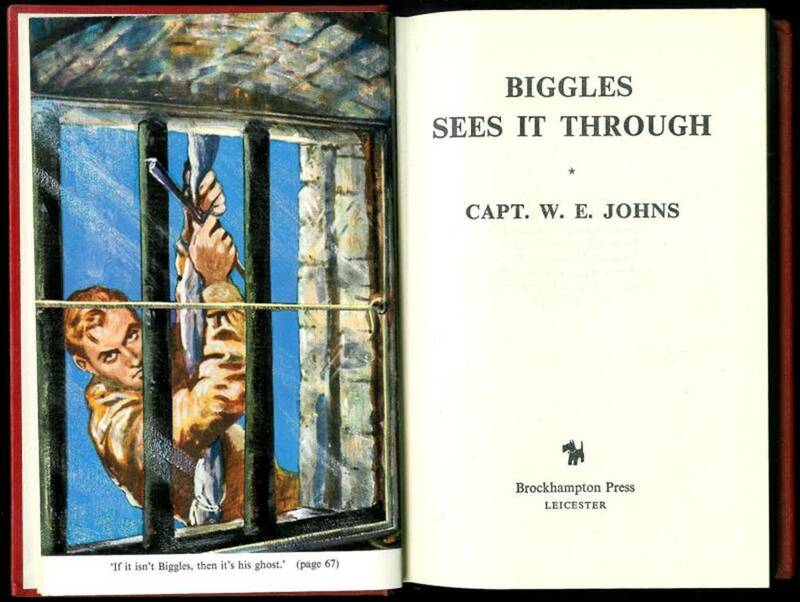 Four of the 101 books that Biggles appeared in were actually “Gimlet” books. Two published by University of London Press and two published by Brockhampton Press. Norman Wright published 2 Biggles books (‘Biggles Does Some Homework’ and ‘Biggles – Air Ace’). The last two published. W.E. 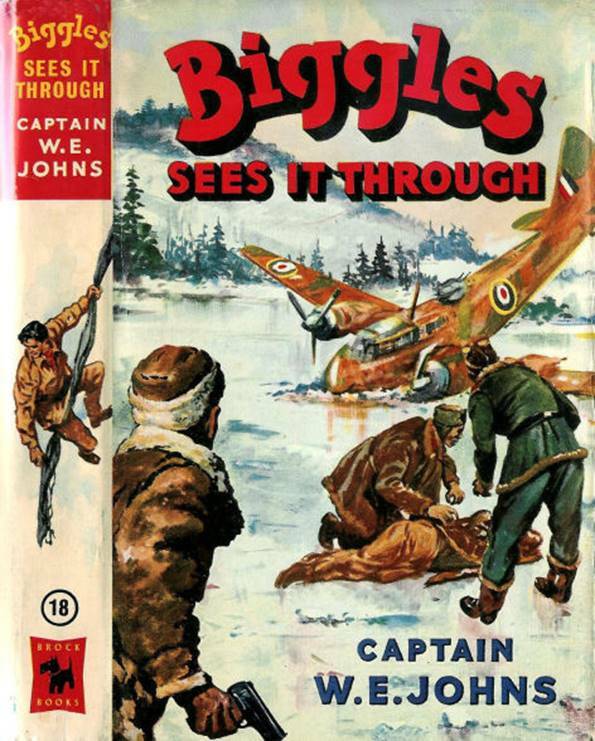 Johns sold his first five Biggles books to John Hamilton outright – and had no royalties. As a result of that, he lost control of those five titles. It was then possible for the likes of the Thames Publishing Company and Dean & Son to reprint these books. 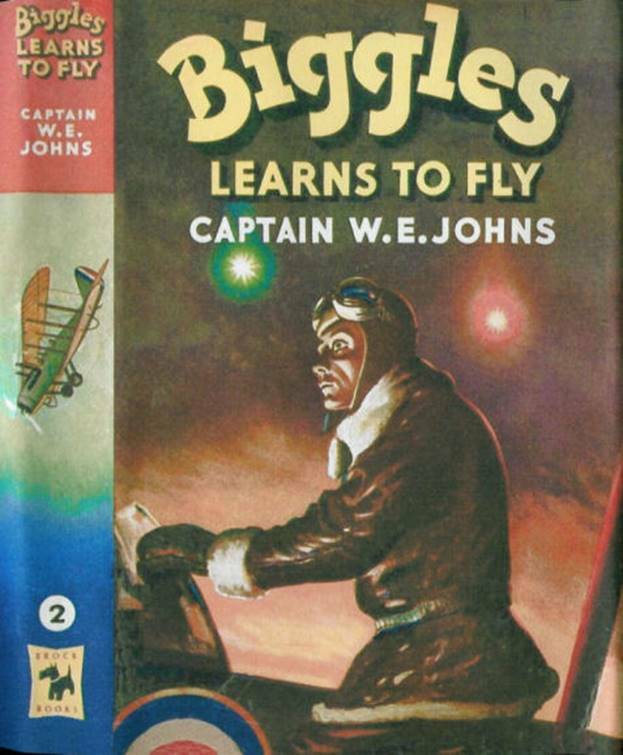 BIGGLES LEARNS TO FLY was “personally revised by Captain W. E. Johns for re-issue” by Brockhampton Press in 1955. When Oxford University Press finished printing reprints of their 20 Biggles books in the mid to late 50’s, they allowed the rights of the 20 Oxford books to revert back to the author, W. E. Johns. When the Biggles books were being printed by Hodder & Stoughton and Brockhampton Press, it was decided – in 1955 - to number them. 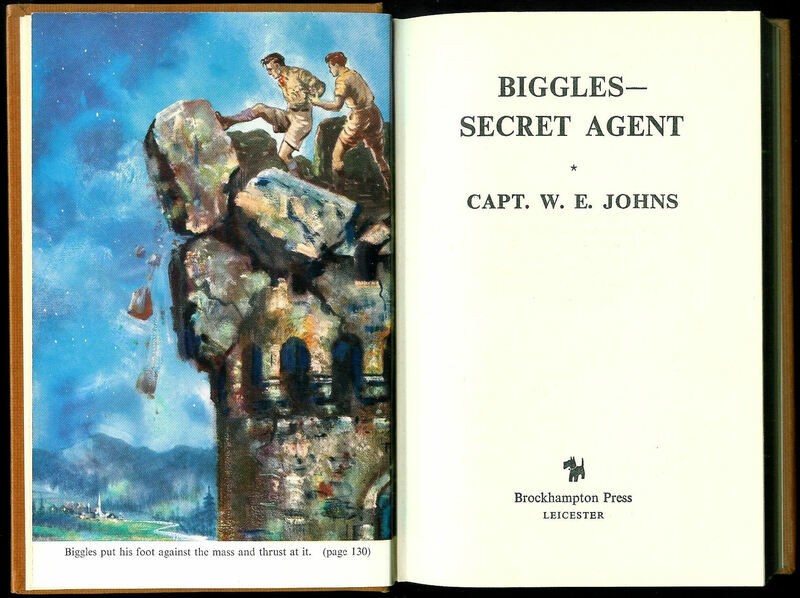 So, in other words the five JOHN HAMILTON books were missed out of the numbering – as was one of the Boys’ Friend Library books (“Biggles in France”). 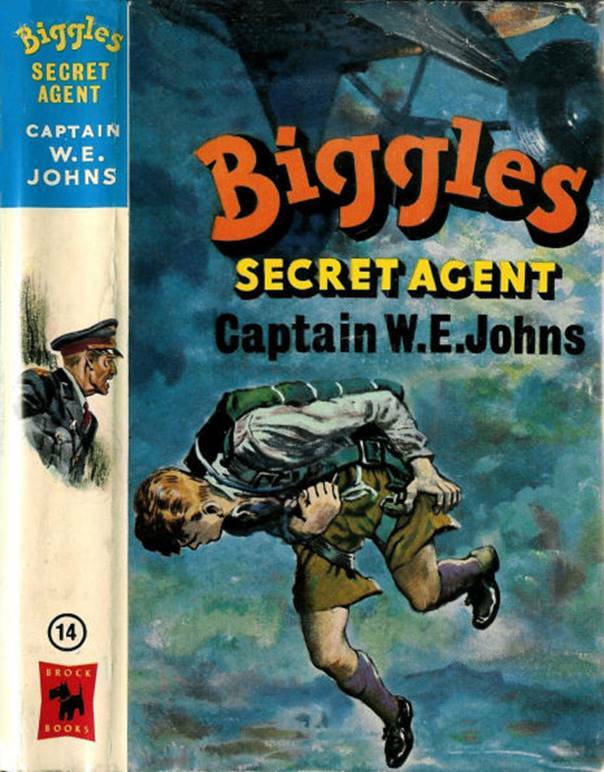 They also missed out the Marks & Spencer published Biggles book from 1950 (‘Biggles – Air Detective’) and the Thames Publishing Company published Biggles book from 1953 (‘Biggles of the Special Air Police’). 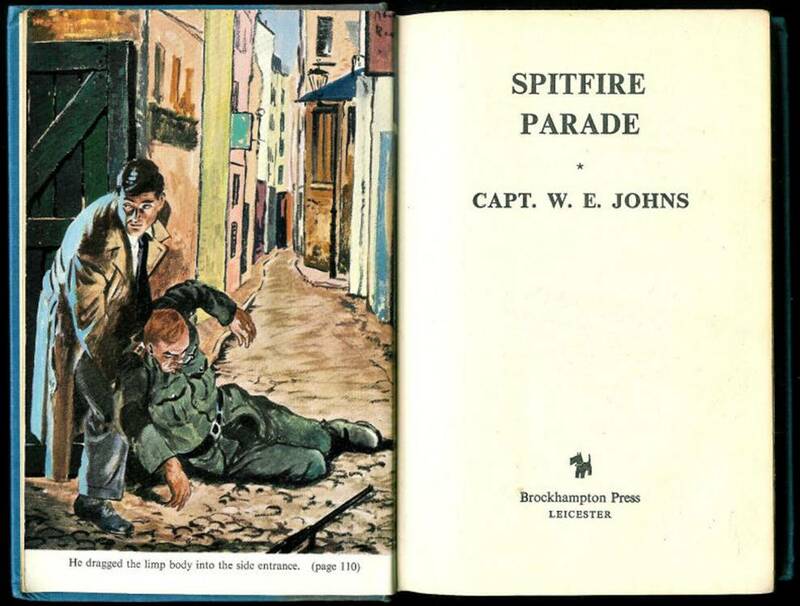 They also didn’t bother to number “Comrades in Arms” which had been published by Hodder and Stoughton in 1947 and featured one Biggles story, one Gimlet story, one Worrals story and three other stories. This means that NINE earlier Biggles books were missed out of the numbering system. Now, bearing in mind that my list of 101 Biggles books also includes the 4 Gimlet books in which Biggles appears, these four books need to be added to that number nine. So we have the numbering system out by 13. The last unnumbered first edition was “Biggles Foreign Legionnaire” published in September 1954. The next book published by Hodder and Stoughton was “Biggles in Australia” in March 1955 and this was allocated the number 44. Brockhampton Press followed in May 1955 with “Biggles’ Chinese Puzzle” which they numbered 43. One can only assume these numbers were given to them prior to publication and it was expected that Brockhampton would publish before Hodder, but in the event they didn’t. After this, they effectively got the numbering system right with the numbers following on in publication order. Hodder’s “No Rest for Biggles” was number 45 and Brockhampton’s “Biggles Takes Charge” was number 46. I have noted these books at my number 58 and 59 in the list of 101 books as the numbering is out by 13 for the reasons I have just explained. In September 1963 book number 67 was published – “Biggles and the Plane that Disappeared”. In the same month, Dean & Son published a collection of Biggles short stories as “Biggles Flies to Work”. This does not feature in the numbering system. 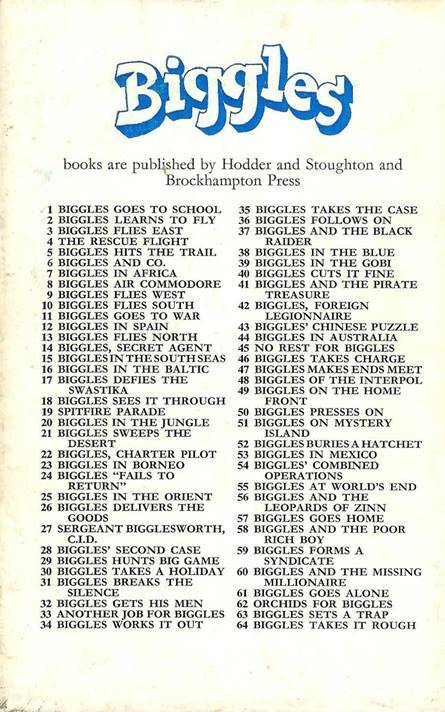 You can see below the numbers allocated for 72 numbered Biggles books up until “Biggles and the Plot that Failed”, published as book number 72 in April 1965. There was then a slip up in numbering. 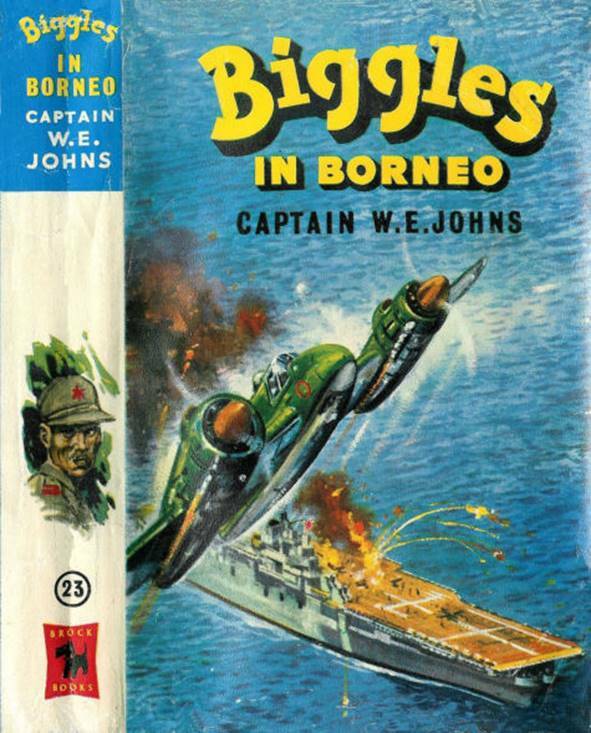 The Boy Biggles – published in March 1968 – was not part of the number allocating system as it was published by a different publisher – Dean & Son. The uncompleted fifth manuscript saw a limited publication when Biggles Does Some Homework was published. 300 paperbacks were published in February 1998 and then 300 hardbacks were published in June 2007. Biggles Does Some Homework and the collection of previously uncollected stories, Biggles - Air Ace. This meant that there were now 17 books not included in the numbering system. 84 numbered books plus 17 unnumbered = the 101 books that Biggles featured in. 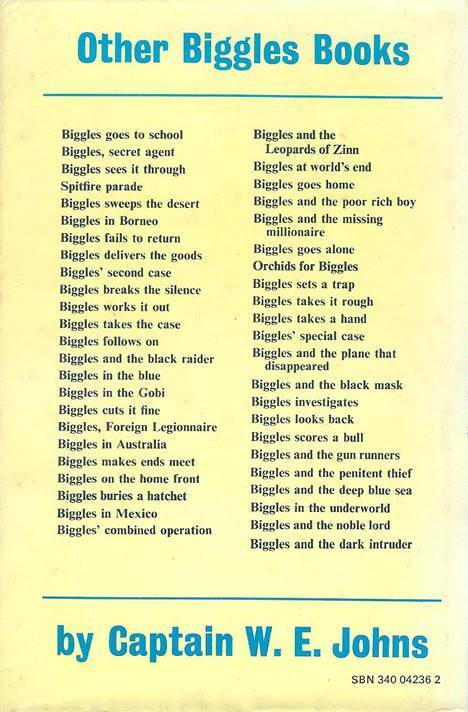 The back of “Biggles Takes a Hand” contained the most titles referred to by the rear of any Biggles book. 64 titles – numbered 1 to 64. After this not every title was featured. 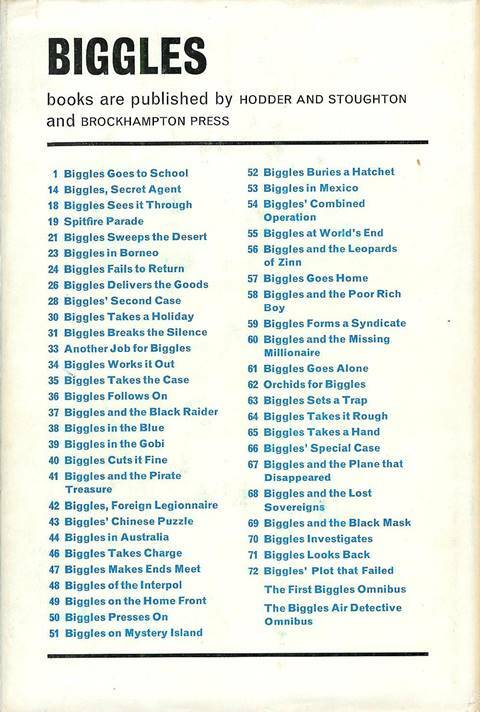 The back of “Biggles Scores a Bull” went up to title 72 but only lists 50 Biggles titles. You will note it starts with book number 1, then jumps to 14 then 18 before running through the books. Books numbered 20, 22, 25, 27, 29, 32 and 45 are all missed out. This was the last Biggles book to number the books on the rear cover. the ones allocated numbers 14, 18, 19 and 23. They are the only four Oxford books referred to in the list above. 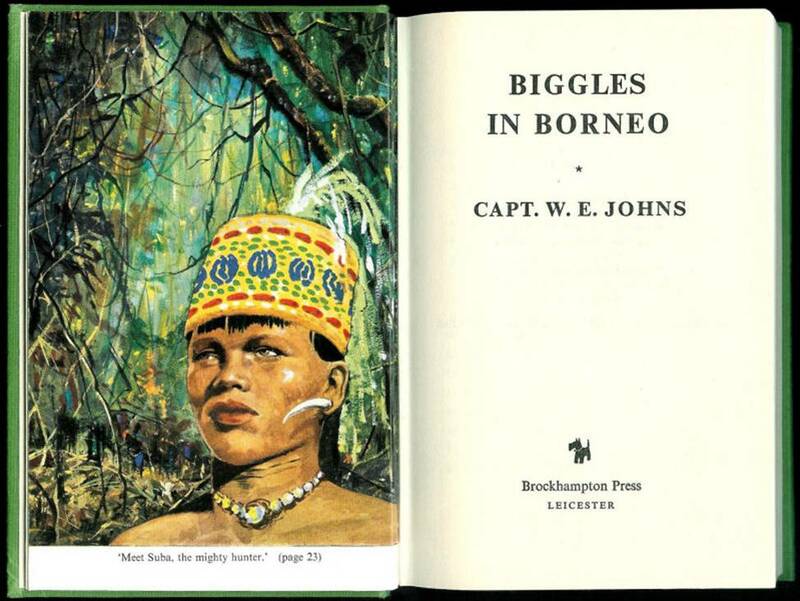 BIGGLES - SECRET AGENT, BIGGLES SEES IT THROUGH, SPITFIRE PARADE and BIGGLES IN BORNEO. You can see the covers of these books and the colour frontispieces – unique to these editions – below. Why were these four Oxford books chosen? The answer would appear to me to be that they were never published as Armada paperback books. 15 of the 20 Oxford books were published as paperbacks by Armada books but not those four. The only other Oxford book not published by Armada was “Biggles Flies West” which was published in the Hampton Library series by Brockhampton Press in 1961. This series has no internal illustrations at all. 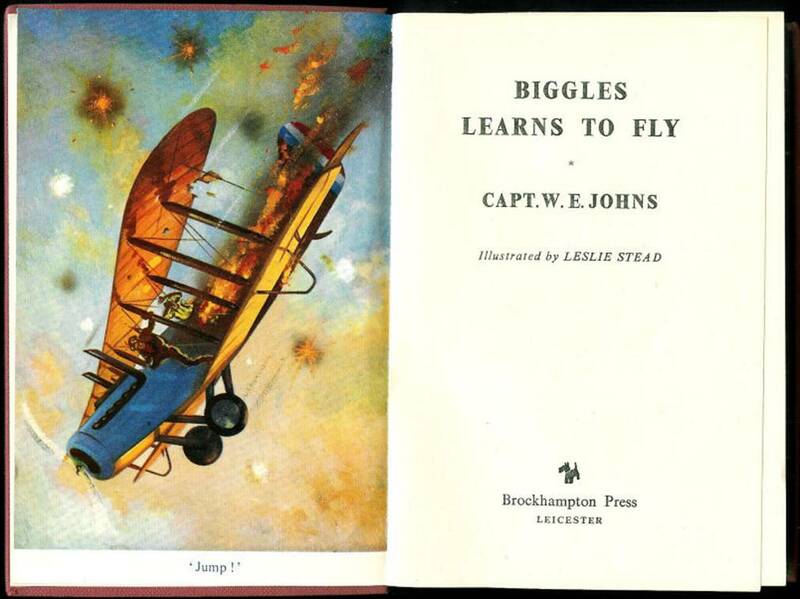 The Hampton Library series contained 14 Biggles books but only 6 of these were Oxford reprints. Those 6 were BIGGLES HITS THE TRAIL, BIGGLES FLIES WEST, BIGGLES FLIES SOUTH, BIGGLES FLIES NORTH, BIGGLES IN THE SOUTH SEAS and BIGGLES IN THE JUNGLE. 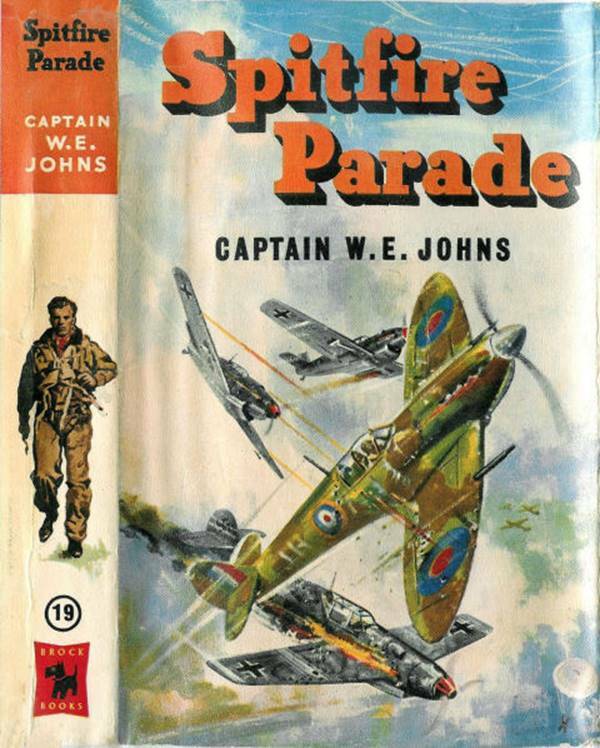 Interestingly, “Spitfire Parade” was published as a paperback by Transworld publishers in their “Scottie Books” series in 1956. I have also included book number 2 – the Brockhampton Press version of “Biggles Learns to Fly" below. This was the only other Brockhampton “Brock Book” reprint and the edition had a unique frontispiece. WHICH OTHER BIGGLES BOOKS HAD NUMBERED SPINES? There were eleven other Biggles books that were later reprinted and had their “designated” numbers printed on the spines of the reprint. These were all books that had originally been published before the numbering system came into being in March 1955.